This past week I unearthed three Marion Zimmer Bradley paperbacks that I vaguely recalled reading about ten years ago. Since I hadn’t picked them up in a very long time, I decided to reread them and decide whether they should stay in my personal library or be passed on. After picking up title #1, Ghostlight (Light, #1), and reading about 75 pages, my new debate is whether or not I should recycle them or burn them. What was that? Did the author just explain the peace sign, a sign completely universal and so ubiquitous? After reading that, I tried to understand what led me to purchase this book – and 2 of its sequels. The cover of my book (at the top)doesn’t scream quivery, shuddering neo-Gothic romance. And it has the name of an author I really enjoy, in big embossed letters at the top. So when did MZB write this, I wondered. And there, on the copyright page, was the answer to all my questions. The copyright of this particular novel is not held by MZB, or even her estate. 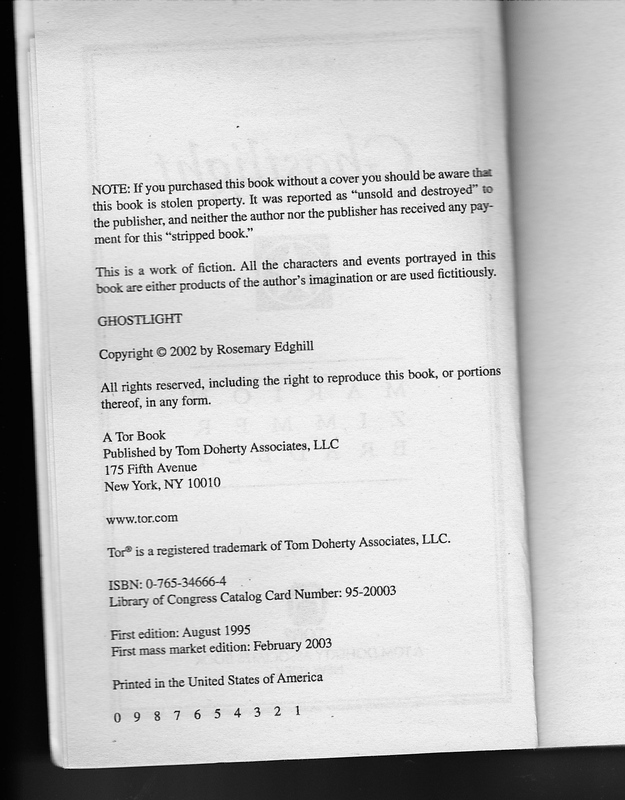 The copyright is held by another author, Rosemary Edghill – who happens to have a number of gothic romances in her bibliography. After doing some basic reading on Marion Zimmer Bradley and Rosemary Edghill, it seems that a number of novels originally ascribed to MZB had their copyrights reassigned after her death. Bradley had been quite ill for many years, and shared the task of writing with several coauthors. Unfortunately, I was not astute enough to realize this before reading Ghostlight. 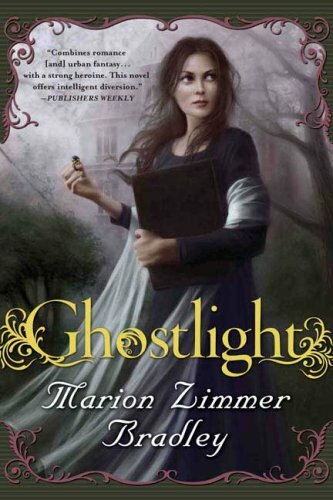 My only consolation is that anyone who chooses their reading material based on cover art won’t be misled – the current cover art for Ghostlight is very nicely gothic. And in the interest of recycling books, I have 3 books to give away to a reader of this blog that posts a comment below. If I have more than one comment, I’ll pick names from a hat. And – you guessed it, these books are NOT by Marion Zimmer Bradley, they are by Rosemary Edghill. Ghostlight, Heartlight, and Gravelight could be yours! These books are all paperbacks, in good condition. Please post your comment by March 28, 2013. Do you know which title of MZB’s was based on a horoscope? I’m also not sure how you came by the information that Ms. Edghill had written a number of “other Gothic romances,” as her five romances that I am aware of are either Regencies (four) or one time-travel romance. (She’s also written mysteries and science fiction and fantasy.) Ms. Edghill also wrote two “alternate Regencies” with science fiction and fantasy Grandmaster André Norton, where Ms. Edghill’s name was clearly on the cover along with Miss Norton’s, with those books containing several fantasy elements. I’m sorry that you didn’t enjoy them. I liked them a great deal, as I viewed “Heartlight” as a historical fantasy with the other three being various types of contemporary fantasy (yes, with Gothic elements thrown in to spice up the mix). But to each, their own. Romance is not a genre I am well versed in, so my classification of Ms. Edghill’s books came from whatever wiki I read about her writings. I’m disappointed they weren’t for me. I did feel betrayed, though, as you point out, MZB is probably not who I should blame. Thanks for your comments! I love a good conversation about books. I’m curious about Edghill’s collaborations with Andre Norton, and I think I will look for them at my library. I’m sorry I missed the posting deadline, the books sounded interesting. I like lots of collaborations, some are better than others, sometimes you can tell who wrote which part, sometimes the two authors work very seamlessly, apparently, this was a case where it was not seamless for you.